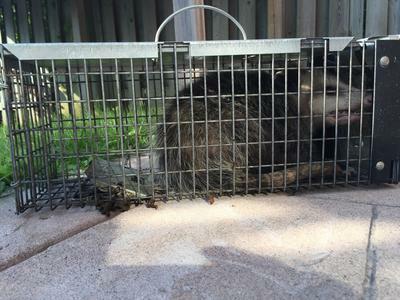 I caught an Opossum in a small squirrel trap where I set a mouse trap in it to find which animal is eating the mice that were caught in the mouse trap. This morning I found the mouse trap 3 meters away from the squirrel trap and an Oppossum in the squirrel trap. Just wonder what is the best thing to do with the Opposum next time I catch one. I will relocate it where it can have a better chance to survive. Thanks for writing to tell us your Opossum Saga - I laughed when I read it! Opossums are pretty harmless, even though they have big teeth, they don't attack people or pets and they eat ticks, so that makes them okay in my books! They will likely find a sheltered area to spend the winter, and they seem to either hibernate or sleep for extended periods during cold spells. Had a possum scurrying away from my peanut-filled bird feeders tonight at 8:50 pm! Thought I was seeing things! Saw my first Possum tonight Adelaide & Stevenson in backyard, just walking around it was huge maybe pregnant? I have a night visitor. So cute. I am in north Oshawa and feed the birds. Think he or she likes peanuts. Had a possum visit tonight. Thornton & Hwy 2. First time seeing it. I came home around 8 pm last night to see an Oppossum scurrying across the front of my garage. I was surprised to see in such a heavily populated area. I saw an Opposum on my patio this morning in Oshawa at 5 am. It scared the heck out of me plus we had a visit from three raccoon's midnight. Our garden is turning into a wild life sanctuary!